Travel to exotic places is fascinating, and equally so are infections and other dangers of exotic travel. Moreover, one need not be traveling to suffer these maladies; sometimes they travel to you. The enormous global mobility demands a public health response. The result is the concept of 'travel medicine' as a separate discipline. This book describes the evolution of travel medicine, travel vaccines, malaria prophylaxis and infections of adventure and leisure. This book is unique and different to the standard textbooks on travel medicine. 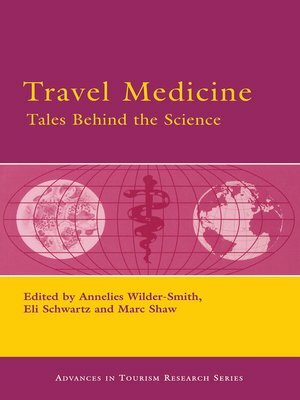 It provides rare insights into many of the behind-the-scenes in travel medicine, personal stories of failures and successes of travel medicine practitioners, the 'real life' tales that unravel the science behind travel medicine. We believe that the best lessons are learned from personal stories. Not every travel is fun. Some travel is for a cause, be it religious or humanitarian, or be it to escape certain political systems. We have added stories on the tragedies of so-called 'undocumented refugees', and stories written by colleagues who were involved in humanitarian care. Pilgrimages attract large number of 'travelers' and yet we know so little about these pilgrimages. Chapters on the Muslim, Hindu, Buddhist, and Christian pilgrimages aim to correct this. Diseases also travel. The spread of global diseases and pandemics is fascinating. This book provides an overview of the pandemics, in particular that of cholera, yellow fever, severe acute respiratory syndrome and influenza. Globalization, migration and health lead to a history of disease and disparity in the global village - our world. And what about the revised International Health Regulations- what do we need to know about them in the context of travel medicine? Annelies Wilder-Smith has lived in China, Papua New Guinea, Nepal, New Zealand, and Switzerland. She is currently based in Singapore from where she continues to travel extensively throughout Asia. She is the Head of the Travellers Health ' Vaccination Centre in Singapore, one of the largest travel clinics in Asia. She was in a unique position to do research on W135 meningococcal disease in Hajj pilgrims during the outbreak. She 'lived through' the SARS epidemic in Singapore. Eli Schwartz is the Director of the Center for Geographic Medicine and Tropical Diseases at Sheba Medical Center, Tel-Aviv University, Israel. Eli is a 'real' tropical medicine specialist. He obtained all his experience in the field, including Nepal, Tibet, and numerous adventure travels to Africa where he prefers to do his studies on the sides of the Omo River. Marc Shaw is a passionate traveler, doctor, actor and observer of fine humor. His favorite pastime is to be an expedition doctor. This has taken him to exotic places such as Namibia, Mongolia, Pitcairn Islands, and to the Amazon. He is the Director of WORLDWIDE Travellers' Health Centres in New Zealand.